Add some playful fun to the most boring of necessities... the humble zipper! 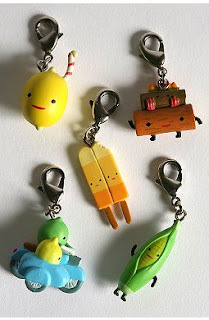 These 'Let's Hang Zipper Pulls' bring whimsey to your jacket, backpack et al. Artist Aaron Meshon created these cutesy pulls in his retro-esque style (he's also the brilliant mind behind the funky Christmas cards I was raving about last December). Twenty-six different characters are available for your accessorizing pleasure. I want the whole set!!!!! !